I came from Java, and now I am working more with Ruby. One language feature I am not familiar with is the module. I am wondering what exactly is a module and when do you use one, and why use a module over a class? The first answer is good and gives some structural answers, but another approach is to think about what you're doing. Modules are about providing methods that you can use across multiple classes - think about them as "libraries" (as you would see in a Rails app). 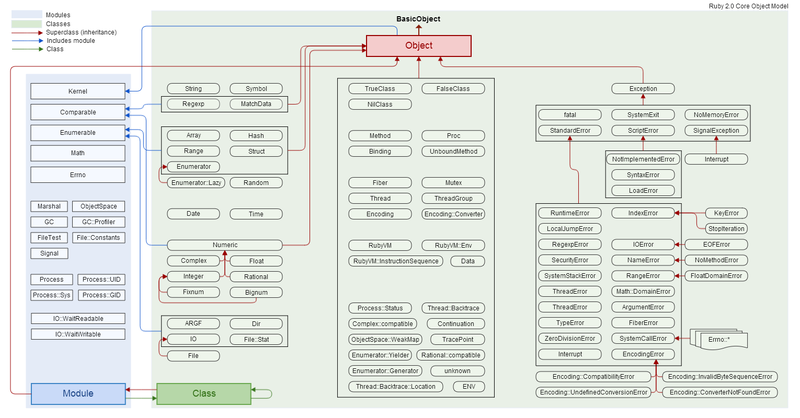 Classes are about objects; modules are about functions. For example, authentication and authorization systems are good examples of modules. Authentication systems work across multiple app-level classes (users are authenticated, sessions manage authentication, lots of other classes will act differently based on the auth state), so authentication systems act as shared APIs. You might also use a module when you have shared methods across multiple apps (again, the library model is good here). I'm surprised anyone hasn't said this yet. Since the asker came from a Java background (and so did I), here's an analogy that helps. Classes are simply like Java classes. Modules are like Java static classes. Think about Math class in Java. You don't instantiate it, and you reuse the methods in the static class (eg. Math.random()). Basically, the module cannot be instantiated. When a class includes a module, a proxy superclass is generated that provides access to all the module methods as well as the class methods. A module can be included by multiple classes. Modules cannot be inherited, but this "mixin" model provides a useful type of "multiple inheritrance". OO purists will disagree with that statement, but don't let purity get in the way of getting the job done. Module in Ruby, to a degree, corresponds to Java abstract class -- has instance methods, classes can inherit from it (via include, Ruby guys call it a "mixin"), but has no instances. There are other minor differences, but this much information is enough to get you started. Bottom line: A module is a cross between a static/utility class and a mixin. Mixins are reusable pieces of "partial" implementation, that can be combined (or composed) in a mix & match fashion, to help write new classes. These classes can additionally have their own state and/or code, of course. So the simplest answer is that module is a namespace, which doesn't exist in Java. In java the closest mindset to namespace is a package. In java the minimum unit is a class, you can't have a function outside of a class. However in ruby this is possible (like python). So what goes into a module? classes, methods, constants. Module protects them under that namespace. When you define a class, you define a blueprint for a data type. class hold data, have method that interact with that data and are used to instantiate objects. Modules are a way of grouping together methods, classes, and constants. => Modules provide a namespace and prevent name clashes. Namespace help avoid conflicts with functions and classes with the same name that have been written by someone else. => Modules implement the mixin facility. First, some similarities that have not been mentioned yet. Ruby supports open classes, but modules as open too. After all, Class inherits from Module in the Class inheritance chain and so Class and Module do have some similar behavior. But you need to ask yourself what is the purpose of having both a Class and a Module in a programming language? A class is intended to be a blueprint for creating instances, and each instance is a realized variation of the blueprint. An instance is just a realized variation of a blueprint (the Class). Naturally then, Classes function as object creation. Furthermore, since we sometimes want one blueprint to derive from another blueprint, Classes are designed to support inheritance. Modules cannot be instantiated, do not create objects, and do not support inheritance. So remember one module does NOT inherit from another! The Apple module did not inherit any methods from the Green module and when we included Apple in the Fruit class, the methods of the Apple module are added to the ancestor chain of Apple instances, but not methods of the Green module, even though the Green module was defined in the Apple module. But Ruby has another important usage for Modules. This is the Mixin facility, which I describe in another answer on SO. But to summarize, mixins allow you to define methods into the inheritance chain of objects. Through mixins, you can add methods to the inheritance chain of object instances (include) or the singleton_class of self (extend). Not the answer you're looking for? Browse other questions tagged ruby class module or ask your own question. What's the hierarchical relationship between a Module and a Class? Ruby - how different are modules from classes? What criteria justifies using a Module over a Class in Ruby? How to DRY duplicated Model Methods in Ruby on Rails, by Modules or Classes?